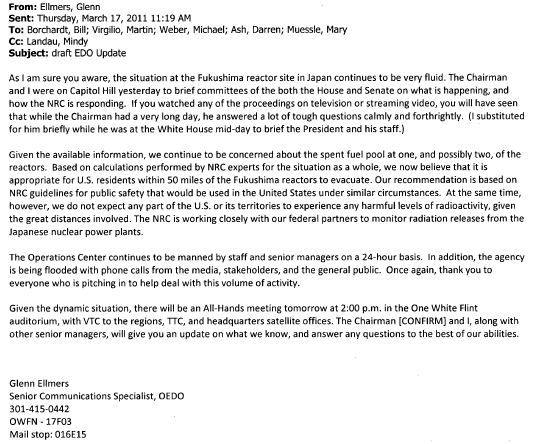 The situation at the Fukushima reactor site in Japan continues to be very serious and dynamic. 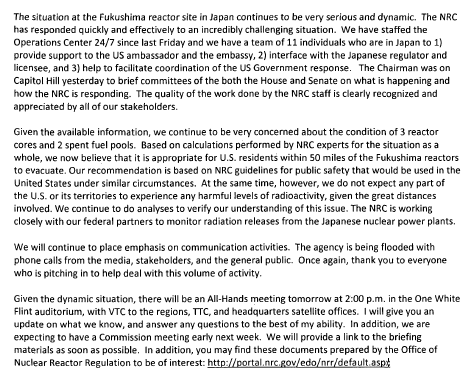 The NRC has responded quickly and effectively to an incredibly challenging situation. and 3) help to facilitate coordination of the US Government response. The Chairman was on Capitol Hill yesterday to brief committees of the both the House and Senate on what is happening and how the NRC is responding. The quality of the work done by the NRC staff is clearly recognized and appreciated by all of our stakeholders. Given the available information, we continue to be very concerned about the condition of 3 reactor cores and 2 spent fuel pools. involved. We continue to do analyses to verify our understanding of this issue. The NRC is working closely with our federal partners to monitor radiation releases from the Japanese nuclear power plants. We will continue to place emphasis on communication activities. The agency is being flooded with phone calls from the media, stakeholders, and the general public. Once again, thank you to everyone who is pitching in to help deal with this volume of activity.